The Crawford Fund’s SA State Committee is proud to have sponsored two 2017 scholars to attend this year’s annual conference on ‘Transforming Lives and Livelihoods: The Digital Revolution in Agriculture’. Click on the links below to view the scholar conference reports. 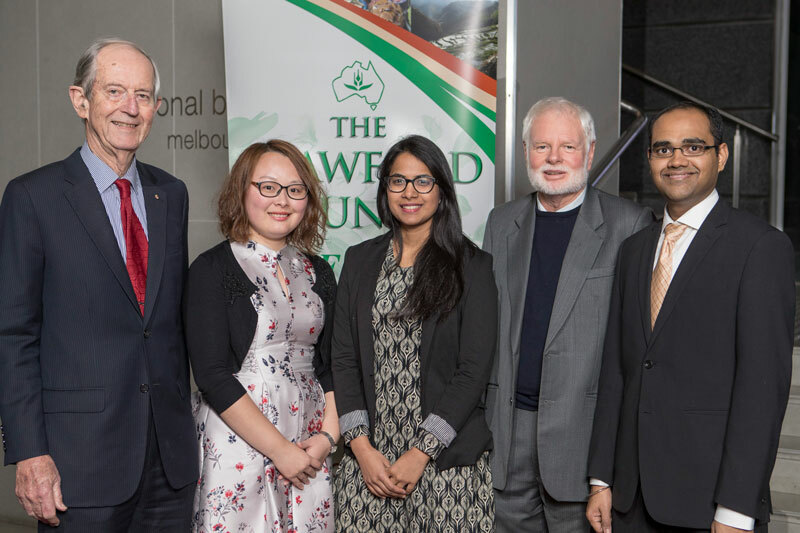 I have been lucky to have won a scholarship to attend this year’s Crawford Fund conference in Canberra, titled ‘Transforming Lives and Livelihoods: the Digital Revolution in Agriculture’. I applied to this conference because I have always been passionate about food security and sustainable agricultural systems especially in developing countries. This year’s conference looked at a specific aspect- Could access to better interpretation of data and information herald improvement in agricultural productivity and profitability in these countries and Australia? I learnt from the various keynote speeches as well as informal discussions that the answer is yes. I left this conference- my first- more inspired and prouder of the scientific community than ever. The conference got off to a great start by one of the most inspiring speeches ever made by Dr Lindiwe Sibanda. The key message that I take from her heartfelt speech is that there is now, a greater need than ever, to move towards a nutrition-sensitive agriculture. She made me realise the importance of tailoring solutions to food security according to each system’s resources and nutritional needs. Most importantly, she made me believe that it is all possible if we all, scientists and policy makers, join forces and move towards an integrated agricultural system. Networking was certainly one of the highlights of this conference. The ability to meet such high-end researchers in a comfortable, informal environment made it a very enjoyable experience, which traditionally in conferences, can be quite daunting for young students. The mentoring part was one of my favourites because it facilitated the integration into the bigger crowd as well as the face-to-face interaction with researchers and/or industry professionals significantly. I was also lucky to have been invited to the reception post conference, where my mentors, Mr Roger Wickes and Dr John Radcliffe were very helpful in bridging the gap between myself and prominent researchers, politicians and other professionals. Another highlight of this conference was the inclusion of the private sector in the talks. When dealing with scientific projects especially for developing countries, the impact assessment is on the environment and/or society- very fair but I think this conference highlighted the importance of making the projects economically viable as well, hence truly supporting sustainability as a three-pillar system. All these talks have on one hand, helped me broaden my thinking horizon and on the other, helped put things into perspective. In summary, this year’s Crawford Fund conference has been an amazing experience. I left this conference truly inspired and very grateful for this opportunity. Sitting amidst, and mingling with, professionals who have carved such an inspiring career path for themselves has been an honour. It helped cement my own goals and aspirations, which are to partake in international agricultural development programs and make a difference in the world. The first step is to join RAID in South Australia and build a network with them. Personally, this conference has been a game changer. I would not think twice before recommending it to anyone interested in international agricultural programs. Thank you Crawford Fund. I wish to express my deep gratitude to the Crawford Fund for sponsoring my attendance at the conference and scholars’ activities. The benefit I gained from the whole event is more than what I thought before I arrived in Canberra. This year the topic is transforming lives and livelihoods: the digital revolution in agriculture. The topic itself is inspiring and it makes me expecting the opening of the conference. As a PhD student from soil science, I always want to know more about the practical agriculture related to soils, such as how to improve plant available nutrient, how to control soil water content in the field, and how to utilize my basic data into agriculture practice. The digital revolution can not only provide me the access to different agriculture development, but also can inspire me with new thoughts relevant to my own project. I found most talks during the conference were inspiring, especially the talk about robotics for food and nutrition security from Prof. Salah Sukkarieh. He introduced some initiatives about utilizing robotics for digital farming, which will be innovative approach to achieve global food security. In some dry regions, those high-techs can help farmers to do irrigation in a smarter way and in this way, plant available water can be controlled, which can ensure the crop growth, especially for developing countries. I think I have to mention the sir John Crawford memorial address from Dr. Lindiwe Majele Sibanda as I am also one of the scholars that inspired by her talk and career. Her speech about her grandmother touched me for a while. She is really an authoritative leader in agriculture, nutrition and climate change and did a brilliant job for Africa agriculture. She mentioned how important it is to make the farming diversity and achieve nutrition security. I got a chance to talk to her during lunch time which would be a motivation for my own research. The highlight of this conference was to be surrounded by many seniors from different part of agriculture, from people working in scientific institutions and universities to people working on the social and economic aspects for agriculture development. The first time I heard the talk from an agricultural company such as Bayer, which was interesting and impressive. Their projects make me feel the real meaning of science, which is for a better life. They have made an important contribution to providing a reliable supply of high-quality food, feed and plant-based raw materials all across the world. GODAN is a very good example for sharing open data to make comprehensive information about agriculture and nutrient available. This makes me feel the access to interdisciplinary, which means that we can not only achieve food security but also nutrition security in the future. The chance for networking is fantastic and I appreciate many talks with those mentors during the whole conference. They are really nice and helpful. They are happy to introduce themselves, what they have done for agriculture and their opinions about the conference. Those are really good opportunities to expose myself to the agriculture field. I feel very happy that I can ask the right person for the answer to my general questions. I also made some connections with the peers. They are passionate about their own research or jobs. I will be in keep in touch with those scholars that I met during this conference and looking forward to future Crawford Fund events.